Setting up the Red Carpet Entrance! The TnT Surf Shop in Imperial Beach, is not your average, corporate surf brand carrying, generic surf shop. Just as the drive down Palm Ave. towards Seacoast Ave. and past the pier has remained unchanged for decades, the TnT Surf Shop is also a step back in time. Remember the days when you would ride your skateboard to your local shop, hang out, get free wax, stickers and a good schooling about the local legends and stories that made your glorious hometown break special? 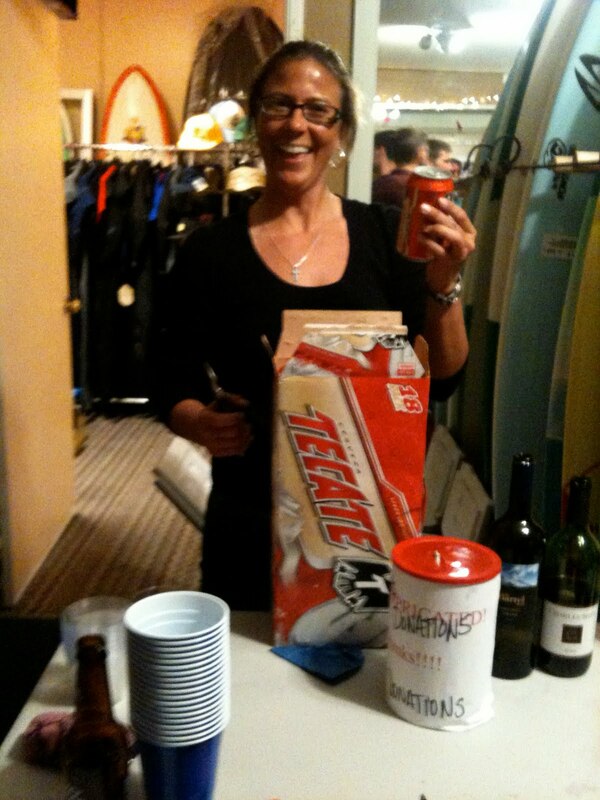 That's what you get today at the TnT Surf Shop. 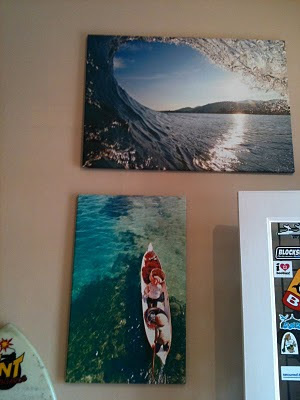 Since opening in Dec. 2009, TnT has further made a commitment to showcase local artists and surfers on it's walls. December's Grand Opening Party displayed the art of local surfers, Cat Slatinsky (photography), Terry Gillard (painter), and Orlando Sherwood (sculpture). On Saturday, May 15, the TnT Surf Shop had it's 2nd Surf Art Gala and featured the work of Manny Vargas and Adam Wraight. Former professional body boarder turned photographer, Manny V's photos range from deep blue water barrel shots to local Balinese fisherman. 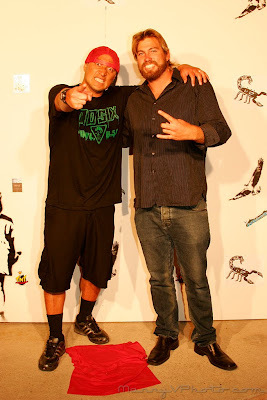 Adam, a local stand out surfer and full time Imperial Beach lifeguard, incorporates a mix of graffiti, stenciling, and acrylic abstract art on a variety of different mediums. It was truly a red carpet affair with full paparazzi red carpet entry into the surf shop, lot's of lights and camera flashes, and wine on the house provided by local IB pro surfer Kyle Knox. Kyle has collaborated with Hill Estate wines to create his very own Barrel Blend, a mix of cabernet, merlot, syrah and malbec grapes. Kyle's Barrel Blend was a hit, and I (the bartender for the evening!) did not get a break all night as people returned over and over for refills. Thanks to Manny Vargas, Adam Wraight, Kyle Knox, owners Tim and Rory Townsley, and event coordinator Cat Slatinsky for all their hard work and great efforts to make this Red Carpet Spring Art Gala one to remember! 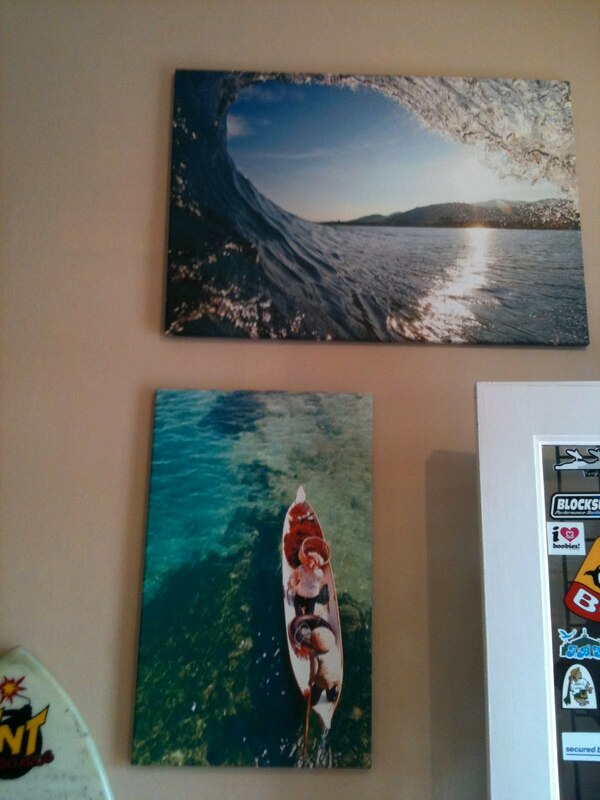 Next time you're in Imperial Beach please come by and check out the TnT Surf Shop located at 206 Palm Ave. 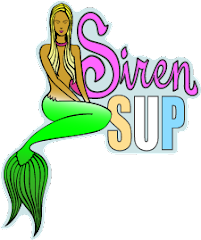 They also carry a nice selection of Siren SUP boards, Kialoa Paddles, No.6 Bodyboards, Katin Boardshorts, Freedom Artists t-shirts and much more. Manny and Adams' work will be on display till the end of July, so come by and check it out!